When Australia were dumped out of the World Twenty20 in the first stage, after consecutive heavy defeats by West Indies and Sri Lanka, they realised it was time to reassess their approach to the shortest format. They looked at domestic success which led them to a Dutchman in Dirk Nannes and also back to Cameron White, whose record makes you wonder why he isn't a permanent fixture. He responded with 55 from 36 balls on a two-paced Old Trafford surface and was the only batsman to come to terms with conditions in the rain-ruined match. From 46 Twenty20 matches he averages 36.52 with a strike rate of 151, yet has only played eight of Australia's 24 Twenty20s where he averages 41 with a strike rate of 150. His domestic record includes a brutal 60-ball 116 against Gloucestershire followed by a ferocious 70-ball 141 against Worcestershire in 2006 when he was an overseas player for Somerset. However, despite his strong numbers he has been in and out of Australia's Twenty20 side and was omitted from the World Twenty20 squad before belatedly being called up as a replacement for Andrew Symonds. "I was a little surprised and disappointed," he said about missing out. "Any time you miss out on selection especially for a World Cup it's disappointing, but that was out of my hands and I've moved on now." Often it is when players aren't selected that they grow in value and White's Twenty20 credentials have been talked up in recent times, something he doesn't mind even though it brings associated pressure. "It's better than being talked about that you aren't very good," he said. "In the past I've probably batted a bit lower so it's nice to get the opportunity to go a little higher. It's nice to do well and prove to myself and people I play with that I can do well." That promotion to No. 5 could be the making of him because it gives him the chance to build an innings. 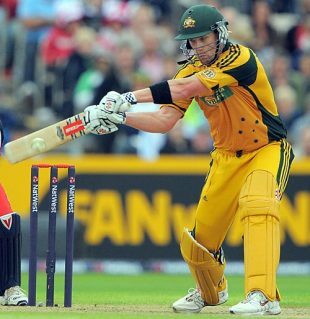 When he came in at Old Trafford, Australia were wobbling on 54 for 3 after the quick dismissals David Warner and David Hussey. The run-rate needed a boost, but firstly White gave himself a chance. He took 24 balls to reach 25, setting a base for the final five-over dash. From his next 12 balls he hit 30, including three powerful sixes. "It's just nice to get another opportunity and take it for once," he said. "It was the situation, I had to get myself in as we needed a bit of a partnership but once we'd established that I could play with some freedom towards the end. It was a funny pitch. It looked like it went through at the start but when the ball got a little older it slowed up. I thought England bowled well in the first six and made it difficult and we did well to get six to seven an over." With all the money on offer in Twenty20 the temptation is there for players to focus on that form of the game. However, White doesn't want to go down that path. It is less than a year ago, in India, that he was selected as a Test match spinner and he still has big ambitions. "I'm not looking to specialise at all. I'm only 26 and that's pretty young so I'd like to play in every format as long as I can." His measured innings grew in value when England began their chase as Brett Lee and Mitchell Johnson tore in with the new ball before rain dashed Australia's hopes. "I was standing at slip, already on the edge of the ring and it felt too close," White said of Lee's pace, "so if that's an indication it was pretty quick." Victory would have been a timely boost for Australia, who are still trying to erase the memories of a week ago at The Oval, but White insists the spirit is good. "It's not as if the room is down and kicking cans. We are still in a pretty good place."